All bike routes lead to the Center of the Universe and this block of Fremont Ave. Image from the city’s Bike Master Plan, calling for protected bike lanes. Red square is the study area. Fremont’s Center of the Universe could get an amazing walking, biking and transit makeover next year, but only if the city chooses to be bold. SDOT is in the early design phase for bus stop improvements on Fremont Ave between N 34th and 36th Streets directly north of the Fremont Bridge. This block is at the epicenter of the neighborhood’s street grid and serves as one of the trickiest bike route gaps in the Interurban regional bike network stretching as far north as Everett. More and more people are biking, walking and taking buses on routes that all converge at this point, but the street design is outdated and has failed to keep up with the people it serves. Sidewalks are overcrowded, especially during peak hours when people are waiting for the bus. Dozens of people walking and biking have been injured in the past ten years in just this one block. SDOT is planning some bus stop improvements for the block to address the sidewalk crowding issue. The project could also create safer crosswalks and protected bike lanes, but only if city leaders decide to make the safety and comfort of people biking and walking a priority. As the project is today in this early stage, biking and walking improvements will be left out entirely. People need to get organized to push for bold action, or the city is going to throw away this great opportunity. Project planners presented their work to the Seattle Bicycle Advisory Board last week (PDF), and it’s clear that bike lane and crosswalk improvements won’t be possible without reducing the number of general purpose lanes. But the project’s “assumptions” list includes at least two lanes in each direction. So biking and walking safety is negotiable, but having multiple lanes for cars is not. This is not acceptable. Safety must actually be SDOT’s top priority, as the department so often claims it is. Imagine this facing north from 34th. The sidewalk stretches are bus islands. I mocked up the existing conditions on StreetMix so you can make your own plans. Image from an SDOT presentation to the Bike Board. The “bus lanes” are not actually bus lanes, just general purpose lanes that buses would use. The safety and comfort of this kind of bike lane is questionable, since it would require widespread education. It would only work if people biking are patient and know to stop for bus users. Everyone waiting for the bus would also need to know to keep the bike lane clear when buses are not present. On top of this, it’s not clear if such a design would fit within U.S. traffic design standards. While I’m all for challenging U.S. standards when they are slow to keep up with best practices in other countries, I’m not sure this design rises to that level. This is not nearly good enough. In fact, the planned sidewalk extension may even make it harder to build quality protected bike lanes with real bus islands at some later date. Seattle, stop beating around the bush. Let’s do this right the first time. 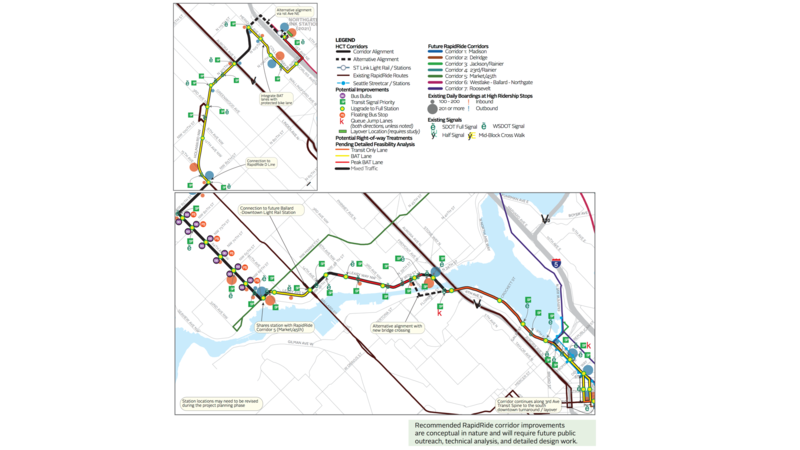 Prioritize walking, biking and transit in Fremont. People driving have many other options for crossing the Ship Canal, including the Aurora and Ballard Bridges, but people biking and walking rely heavily on the Fremont Bridge. Even with its skinny sidewalks, the Fremont Bridge is by far the most comfortable and accessible way to walk and bike cross the canal west of the University Bridge. A more comfortable Center of the Universe would be a boon for businesses in Fremont. The vast majority of people shopping in downtown Fremont already get there by biking, walking and taking the bus. A 2014 study (PDF) found only 10 percent of customers drove alone to Fremont, while another 12 percent carpooled. 10 percent bused, nine percent biked and an astounding 57 percent walked. Fremont Ave is begging for a modern remake to catch up with the ways people are already getting there. There will never be a better time to make this change than right now. This entry was posted in news and tagged fremont, fremont ave, fremont bridge, sdot. Bookmark the permalink. The biggest problem in Fremont in my opinion is the abominable 39th St light. Pushing a stroller, I cannot even make it all the way across both roads to the east on a green light. And the light cycle is over two minutes long. If you can make a video of people failing to make it across the street in time, I can help you make a good argument to SDOT’s signals team to fix the signal timing. It’s already horrible enough waiting for the light to turn green to cross. You can wait 5 minutes to get from the SW side of 35th & Fremont Place to the NE side. To allow for a longer walk signal, which is a good thing, something else has to go. Agreed. I try to avoid doing that walk partially because of the hill, but it’s the light/intersection that’s the deal-breaker. I’m not in the neighborhood much anymore, but last week I remembered and ran uphill specifically to catch the second light. Another way to look at the problem is that the nexus is too small. There’s too much trying to get through this tiny space, compounded with the additional nexus of the Fremont bridge. One solution would be to divert some of the traffic to other streets rather than have all traffic go through the nexus. I’m not saying which traffic should be diverted, and whoever gets diverted may have to encounter a slight detour. However, the result may be faster flowing traffic for all. For example, we could divert bicycles to 34th st (already has a new bike way) and then north on Evanston and back east again on 36th to connect with Fremont. Again, a detour, but it doesn’t stop one from cycling on Fremont, just gives an alternative. All over the city local bike access is often run roughshod by through-access for cars, but in Fremont there’s a lot of bike through-traffic struggling to get through a swamp of local-access cars and trucks. You always can ride up Evanston to 36th to Fremont Ave (that’s my typical route north from many lower-Fremont destinations; it’s illegal today to make the left turn from 36th to Evanston southbound), but you still have to deal with cars turning in and out of PCC, delivery trucks, and confused/frustrated/aggressive drivers looking for parking on 35th. So I’ll do that when it’s on the way, but it’s not worth extra distance, stops, and turns to do it coming off the bridge. But just trying to cram everything in that section is going to be very unpopular – it just won’t work. What can we do to reduce some of the existing bottle neck? Another thought would be to limit the access to Fremont Place. Would it work to prevent 35th street from crossing? It’s all about car capacity — that’s where the space is! Buses pretty much have to be there; for bikes whose ultimate destination is between Fremont and Greenwood detouring will always be annoying, and encouraging cycling is explicitly a goal (for us and for the city). The Fremont Bridge’s low height is awesome for pedestrian access to destinations on both sides of the bridge but frequent openings mess up motor-vehicle capacity. So… why pretend the Fremont Bridge should be a major arterial for private vehicles? Change one of the lanes on the bridge, and on Leary/Fremont Place to a bus lane. Private drivers adjust and take the Aurora or Ballard Bridges for all but the shortest trips, relieving the pressure on Fremont Avenue and Fremont Place that’s “forced” SDOT into the confusing layout they have today. And some might switch from four wheels to two in response to less chaotic conditions between 36th and 34th — I know people that live and work right there that don’t bike for transportation because of those blocks. My commute approaches on the Burke these days, but it used to go down Fremont, and I really did try to find any crazy route that would let me avoid the block between 35th and 34th southbound (a lot of days I turned right on Fremont Place and left down Evanston if it looked like there would be buses stopped in the right lane). I think the problem is that if you restrict things too much, then it just becomes a giant traffic mess for longer in the day. Since there are no bus lanes, it means bus traffic sits in the mess (which, as you say, is an area that inevitably must be served). People may adjust — especially people going a long distance — but unless we start taking lanes for transit, things could get a lot worse there. One possibility would be to start by adding bus lanes on Westlake. That would mean taking a lane from general purpose traffic, but that would be the point. Not only would the bus go faster, but it would restrict the flow upstream. You could do the same thing on Nickerson and Dexter and you wouldn’t have nearly as much car traffic going north over the bridge. Then you could easily take a lane north of there, and just give it the bikes. Southbound you would do something similar. Add a bus lane for the Metro 40 — along Leary, then Fremont Place, then Fremont Avenue. This means that you have converted one car lane for bikes (both directions) and one (southbound) lane into a bike lane. This would make Fremont a lot quieter, which really makes sense given the foot traffic in the area. General purpose traffic would be slower, but it would likely shift to other streets. Meanwhile riding a bus would be much faster than driving, which would likely lead to an increase in ridership (and thus a decrease in driving). Biking would be safer and more pleasant through there. I’m curious what the blue on 50th St going east from the zoo is, because right now it is a scary narrow bike lane pinning the cyclist against a wall going eastbound combined with mixing traffic a little later. Summary: no (reported) pedestrian crashes. 1 car-on-car crashes that resulted in an injury, and plenty more property-only crashes. 5 crashes involving people on bikes, with 4 of those people heading to the hospital. That’s an average of ~2 bike crashes/yr, which speaks towards the need to improve safety for people biking along this block. Given the perfect weather conditions during the bike crashes, it’s clear that these crashes weren’t related to weather or lack of lighting. I heard anecdotally of a car that hit-and-ran a pedestrian turning left from the bridge onto 34th. That was a bit over three years ago and probably wasn’t reported, though. That left turn just needs to go. I agree Al, you shouldn’t be able to make a regular left turn there. One possibility would be to add a left turn arrow, but only activate it outside of rush hour. So basically a “Left turn on left arrow only” sign, along with the current rule “No left turn 3-6”. That would allow freight to get into that area, which is probably the only reason the city hasn’t eliminated that left turn all together. To have a left-arrow you either need a place to wait for a left-arrow (there’s no room for an extra lane on the southern approach to this intersection, which is on an elevated bridge approach) or to switch to all-go phases both northbound and southbound (blech), but only off-peak (super confusing, particularly if it results in allowing southbound left turns, too, but only off-peak). There’s a similar problem on eastbound Denny at Dexter, where the left turn is categorically banned westbound, and the solution there is no better than what’s at Fremont/34th today (allow left-on-green, but then have an additional eastbound all-go phase to allow stopped traffic in the left lane to clear). Anyway, not many businesses actually need to take deliveries along that block of 34th. The Epicenter/PCC building has a loading dock on Evanston and an alley running behind it; the Google/Key Bank building has a loading dock on Northlake Way. The buildings fronting Fremont Ave () can take deliveries there some hours of the day. For the rest, there are other ways to get to 34th from the bridge, they just take a little longer. The same thing is true for motor-vehicle access to businesses east of Fremont Ave (Schilling Cider House, Cafe Turko, etc. ): turning left from southbound Fremont at 34th is never legal. Somehow they manage. The typical solution to taking a left is to take three rights. In the case of Schilling Cider House and similar places, that is what they do. My guess is most of the time they are approaching from 36th (Leary) so they just keep going straight. Since the businesses are on the north side (the right side of the street if you loop around) it is a very good way to go. Looping around (taking three rights) is very time consuming if you came from the Fremont Bridge. However, I completely forgot about the left turn on Fremont Place to Evanston. There is a left turn lane and a left turn arrow. So I’ve changed my mind. There really is no reason to allow a left turn on Fremont and 34th. If you delivering something to the PCC (or anywhere else in the area) you just take a left and another left. That really is no problem at all (unlike three rights, which could put you in really heavy traffic). So, yeah, you’re right. The city should simply outlaw left turns there. Right, PCC’s loading dock is on Evanston, so using Fremont Place to Evanston isn’t much slower than going left at 34th. There’s a pho place and I think an urgent-care clinic that may have to take deliveries from 34th, and 34th is one-way westbound, so you can’t use Evanston to get there so easily. You either have to make three rights or do a crazy contortion: left on Fremont Place, left on Evanston, left on 36th, right on Fremont Ave, right on 34th. And to that I say, tough tomatoes. For the most part the three-rights route is only congested during rush hour when the left-turn at 34th is banned anyway. The one thing that’s bad about the three-rights route off-peak in a truck is continuing straight on 34th through Fremont — you have to merge across the bike lane to get in the right lane, and they allow parking and loading so close to the intersection off-peak that you can’t even get to the right lane without crossing solid lines. Even people driving standard passenger cars often block the bike lane. So… maybe don’t allow parking and loading so close to the intersection? There’s an alley behind those buildings that could presumably be used instead? And this just shows the folly of trying to use the Fremont Bridge as a major through-traffic route right in the middle of a busy commercial district. The cramped layout of 34th is only necessary to accommodate the double left-turn lane toward the bridge. Is it too early for us to start sending emails in support of eliminating a car lane in favor of PBLs? I never like spamming people, but the presentation you linked provides contact information for Domenico.Martinucci@seattle.gov. Emailing Nico can’t hurt, but I think a campaign of some kind is needed. Nico is planning within the assumptions of the project scope. It will likely take higher-up leaders to change the scope. This probably means the Mayor’s office and/or Council offices. Definitely email Nico. He’s absolutely the guy to talk with. Whatever the solution is on 34th or on Fremont Ave, we need to keep in mind what delivery trucks are going to do. Currently they routinely block the uphill bike lane on Fremont Ave, and it can be different to get around them when there is other traffic. So Streetmix doesn’t have a statue of Lenin as an option? The first concept just can’t work and never will, as long as the Fremont Bridge is the main crossing. There are too many southbound vehicles, combined with 15-20 buses per hour at that stop. It would cause insane backups to the north and west that can’t be justified for the 200-1000 (depending on month) southbound bike trips. The second concept is going to be the best option, but will require concessions from all sides, plus (as stated) modification to roadway design standards. Roadway standards are not set in stone, but modifications require studies, effort, time and money from a jurisdiction that is brave enough to undertake the effort. SDOT doesn’t really seem like they’d ever be willing to undertake that effort. the block to the north, between 35th and 36th also is problematic. There have been a number of bike crashes over the past 8 years in this block . This block is more easily fixed simply by reallocating the 8-10 parking spaces to a PBL. The bike lane treatment in the 2nd concept could work in a low volume situation, but in this location where there are many bikes, many buses, and many people walking and waiting for the bus, it would probably cause more problems than it is trying to solve. As stated above, something has got to give, but having the whole neighborhood breakdown from a traffic point of view would be a loss for everyone. I would like to see the following modeled: northbound bus/bike lane, through-left, and left. Also, I would argue that a SB bike lane is more important from a safety point of view than widening the sidewalk on the west side by 5 ft. I can think of many sidewalks in this city and else where that are more crowded than this sidewalk and just as narrow-not ideal, but it works. I think the flow of car traffic could go a lot more smoothly if the city simply eliminated turning in either direction for n/s drivers. After riding and driving through there every single weekday for three years, that (and bad light timing on the south side of the bridge) is what seemed to cause the bulk of the backups. They also need a pedestrian/bikes all-way green light (while I’m dreaming). Another major issue is that the lanes are simply not wide enough for buses, or most large cars, so even when everyone’s in their lane there’s not enough room for people to get by in their own lane. I really don’t see how they’re going to keep four lanes there no matter what they do. But controlling the turns and allowing bikes/peds a head start to get through there with their own designated light would make a huge difference even without any changes to the paint. Two things to consider are that the Westlake bike lane only opened recently. It and Dexter don’t even properly reach downtown yet. When those connections are made, bicycle volume to/through Fremont should only increase. Also the Burke Gilman finally reopened to the East with good access to Link, which should generate some trips). Also, I actually rode Fremont Ave on Pronto once up to Greenwood. That was not particularly pleasant or efficient. But I am certain it would be a popular route on an e-assist bike share with so many destinations along the way. The current expansion plans would probably only reach lower Fremont, but I’m confident this is a city that can think ahead a few years. In the likely scenario that we can’t just tell drivers the Fremont Bridge isn’t a major car route, I think that having bike lanes that double as bus-loading areas (as in “option 2”) should be better than the status-quo “option 3” where the lane bikes use is also the lane buses stop in. People boarding and exiting the bus use a lot less space than the bus does, so people biking don’t have to wait behind the entire bus, which can be a problem when a couple buses come right after eachother with a few cars in between, blocking the entire block face for the first bus’ stop, then half of it again for the second (the second bus often isn’t in the zone while the first one is boarding). A cyclist is either stopped breathing fumes for quite a while (possibly behind the previous intersection if being particularly polite/alert) or changing lanes into traffic to pass on the left (then changing back to the right across the face of the bus re-entering traffic, which is usually awkward). Or doing something sketchy to pass on the right, but I won’t even go there. I think cyclists should be able to figure out how to stop for bus passengers without much prompting, just as drivers figure it out for the Muni on Taraval in SF (and reportedly on some streets in Toronto also). These days the lane would be raised, which is more than the Muni riders get, and if we really wanted to drive home the point we could embed some lights in the ground that flash when bus doors are open (technology!). This would get us through in a more predictable way, still working with instead of against traffic signals that favor major vehicle and bus flows, letting us make partial progress when buses are backed up. And when we have to stop we’ll be doing it in a more comfortable place.